When water damage occurs, it is important to rectify the situation as quickly as possible. Timely Water Damage Restoration is one of the best ways to minimize damage and prevent mold growth. But what makes mold so bad, anyway? It is just a fuzzy, ugly green patch, right? Wrong! Not only can mold cause major structural damage over time, but it can be extremely bad for your health, as well. According to the Environmental Protection Agency, “mold can lead to a variety of health effects ranging from more common allergic reactions, to asthma attacks, and hypersensitivity pneumonitis.” Additional health issues include: wheezing, difficulties breathing, sore throat, sinus congestion, persistent coughing, skin irritation or rash, vomiting, pulmonary hemorrhage, memory loss, liver damage, and much more! 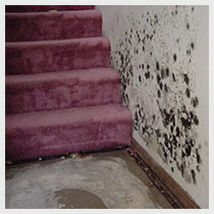 If you find mold in your home, it is important to remedy the situation as soon as possible. The longer you wait to act, the worse the situation can become. Remember, mold spores can even find their way into your HVAC system, quickly circulating and spreading throughout your home. ServiceMaster of Lincoln Park Chicago is an IICRC Certified water damage restoration and mold remediation company. If you have any questions about Health Effects of Mold & the Importance of Timely Water Damage Restoration, please contact ServiceMaster LP Chicago by calling 800-515-1982 or click here today!